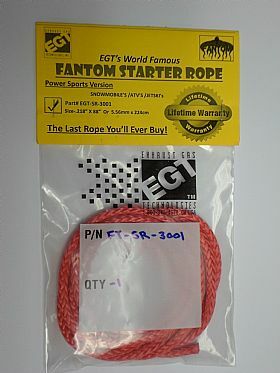 SUPER tough synthetic fiber braided rope to fit just about any recoil starter. Superior Lifespan without fraying and is resistant to gas and oil, with over a 5,000 pound tensile rating, it carry's a 100% LIFETIME REPLACEMENT WARRANTY! Please choose the appropriate Size & Length below for your application!